2010 July 26 » Change Myself. Change the World. The Aussies are leaving today. I never got a chance to take them tubing down Boulder Creek. Too bad. (I still plan like to find time to do that this summer though). Anyway, it is sad to see them go. They were a lot of fun to have around. With all the ATV’ing and camping and riding the alpine slides and all that stuff Jake said his favorite thing was doing demolition on Paul’s kitchen, Hahaha. Amy said her favorite was just spending time with the family in general. I think Riley liked the game with the sundaes and going to Lakeside. Yeah Lakeside. I didn’t even know that was still there. It opened in 1908! 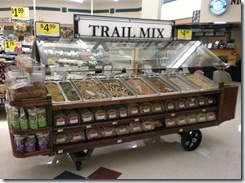 The grocery store by my house just put in a trail mix bar. Great idea. 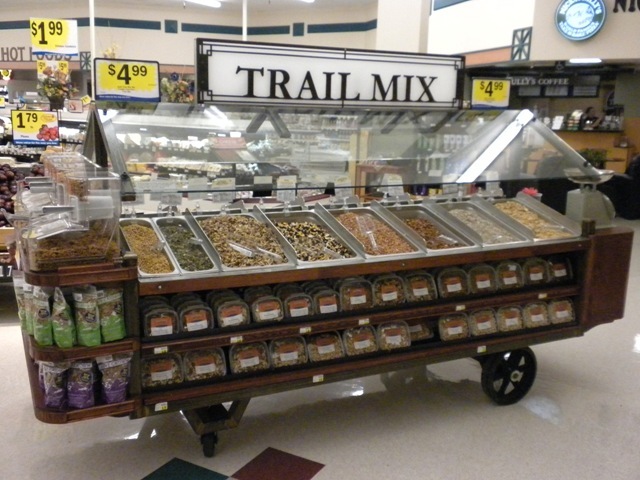 It has everything from nuts and seeds to raisins and dried cranberries, M&Ms and mini chocolate chips to 8 different kinds of granola. It even has a bin for raw unsweetened coconut. Mmmm. For my first customized batch I pretty much added a little of all of the above. It looks like a mess but tastes fantastic. Raisins – I am going to try to make these in my dehydrator. Apples – And other fruit dried in my dehydrator. Jelly Bellies, Gummy Bears, Skittles, Runts… heh heh. But seriously, feel free to suggest any other ideas you might have.